Fly Fishing Jazz: Am I Blue? Well, if I’m a bug or a baitfish, a worm or a leech that trout like to eat, odds are, I am not blue. In fact, you can turn over a million rocks in a river, and (unfortunately) you’re more likely to encounter a blue bottle cap or other piece of debris than something that’s bright blue. I’m not talking about Blue Dun blue, or Blue-winged Olive blue, which is really more gunmetal gray than Boise State Bronco “Smurf Turf” blue. The thing is, blue flies, and even purple flies, work really well for trout. An electric blue Psycho Prince is a killer pattern when the fish are finicky. 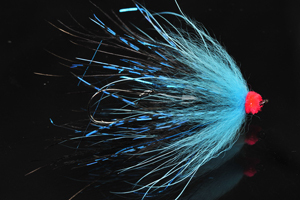 A blue Latex Midge can be absolutely astounding in low, clear winter water, when trout are most lethargic. Even blue San Juan worms are the rage among some guides I know. But it’s not just about trout—even bass are attracted to blue and purple. When the bite is tricky, and the bass pros are finessing soft plastics, you’d be surprised how often they give up the standard “Green Pumpkin” for something with a hint of Junebug purple or Cotton Candy blue. I’ve been offshore tuna and marlin fishing, with the boat trolling a full spread of many colors, and have seen that the blue or purple skirt is the one that gets bit, over and over. I’ve also been told that the way light bends and refracts through aquatic environments has something to do with blue/purple appeal. The way the light works, the bugs tend to stand out and “pop” more in the fish’s field of vision. I don’t know if that’s true or not, but I don’t have any reason to doubt it. Because I know blue flies, and purple flies work, especially in attractor mode. Which brings us back to the jazz and improvisation line of reason. If you’re a fly tier, why not try different colors in some of your standards, particularly blue? A horse—in this case, a fly—of a different color might just be what you need to shake off the no-fish blues.